Time marches on and we notice everyday things start to change. We move a little slower, require more time to recharge and for some, sound seems to affect us differently. It’s not your imagination that some sounds seem louder than others and more annoying than before. Some noise issues, especially hearing loss, can and should be corrected with hearing aids. The first step to making sure you keep your hearing where it needs to be is to make an appointment for a hearing test at Pacific Northwest Audiology. Have you started a conversation with an older adult and they ask you to please speak up – and then, a very short time later, complain you are talking way to loud and you don’t have to shout? They may be suffering from loudness discomfort. Sound sensitivity as we age is most common in individuals with hearing loss, but it can occur without hearing loss. Some become so sensitive to sound they can barely tolerate what many others consider a “normal” level of sound. Hearing devices can alleviate some of this discomfort because their processing is set up to not overload the ear with sound amplification. The newest models can adjust almost instantaneously to a loud noise like a door slam. As we get older, the hair cells and nerve fibers in our inner ears deteriorate. 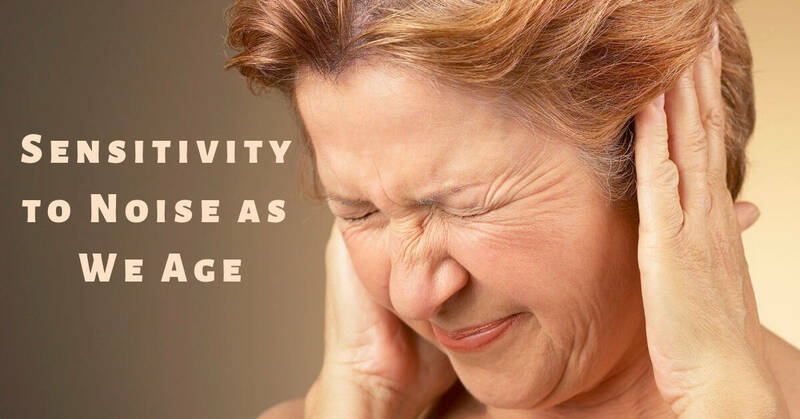 Some studies have shown that a reduced blood flow, which is a natural part of aging, causes changes in our ears. It could also be due to prolonged exposure to loud noises or a combination of factors. Once the cells are damaged, they do not recover. We notice first that different sound ranges are impacted. The high range goes first. An article published in the Journal of Neuroscience said a study examined the auditory cortex of individuals in their 20s and their 60s and they were different. This might explain, researchers said, why some individuals develop an oversensitivity to sounds. As you get older you have issues separating background noise from the sounds you are trying to listen to and process. Scientists monitored the brains of adults between the ages of 18 and 31 and also adults between 60 and 70. Each group was given a listening task and the younger group was able to zero in on and concentrate on the specific noise while the older group could not. The younger adults barely noticed what the older adults found was distracting background noise and they were able to pinpoint specific other sounds. Older adults report problems understanding a conversation with noise around them. Part of the problem is hearing loss, but new studies also show the brain’s ability to filter out background noise changes as we age. One explanation, said researchers, is that the brain synchronizes with the specific rhythms of speech. When monitors were attached to study participants to chart brain and neural signals, the signals in the older adults’ brains fired in a pattern to match the background distracting noise and that inhibited their ability to hone in on the target noise. Researchers had two theories as to what caused the issue. One was that hearing loss leads to a decline I the brain’s ability to filter out noise and concentrate on a single sound. The other is that the brain’s sound processing changes. Sounds that seem the most jarring and distressing would be high-pitched sounds like smoke and carbon monoxide alarms, but equally disturbing to those with noise sensitivity are the clanging of silverware or pots and pans, clapping and children screaming. Our team at Pacific Northwest Audiology provides comprehensive hearing health services, from a hearing test to hearing aid fittings. If hearing aids are needed, we work with you to find a model and style that you find most comfortable and useful. Hearing is one of the primary senses and its needed to keep you functioning at your best physical and mental level. Call for a test today.